I’d been having this strange problem with my Virgin Media (Telewest as was) broadband. Basically, after about 5 minutes of trying to download files, the cable modem would ‘hang’ where the data light would stop flashing. The only way to get back to normal service was to unplug and reboot my cable modem. I suffered this fault for a few weeks – the delay between reboot and crash seemed to vary between 5 minutes and a day (I suspect it was based on how much data had been downloaded, but I’m not sure). Then after two phone calls with Virgin Media tech support I eventually got it fixed, and I thought it might be useful to post the information here. 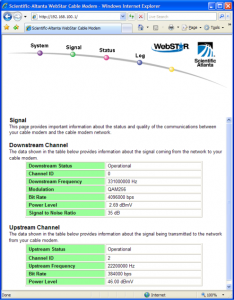 Disclaimer: If you follow any of the advice here and screw up your cable modem its not my fault! 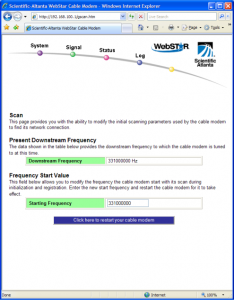 These instructions probably only apply to the WebStar cable modem I have as well. 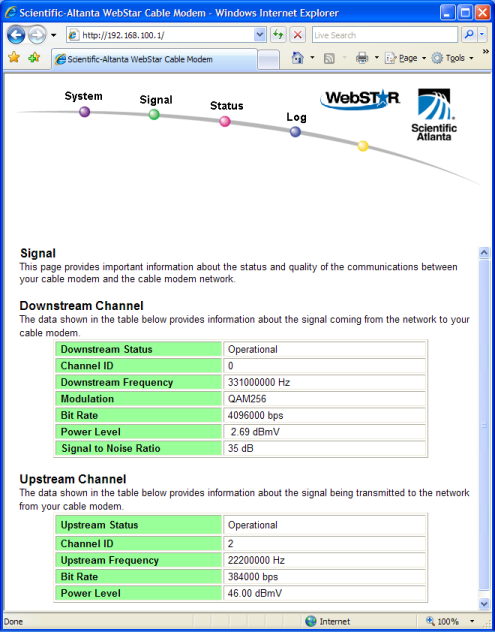 First off, you can view your cable modem status page by going to http://192.168.100.1 in your browser. The following diagram shows the signal screen. If you look carefully at the Downstream Frequency it reads 331000000Hz. Apparently either 331000000Hz or 339000000Hz are valid values, but mine was reading 3312500000Hz which isn’t a valid value, and hence was the cause (or symptom) of the problem. 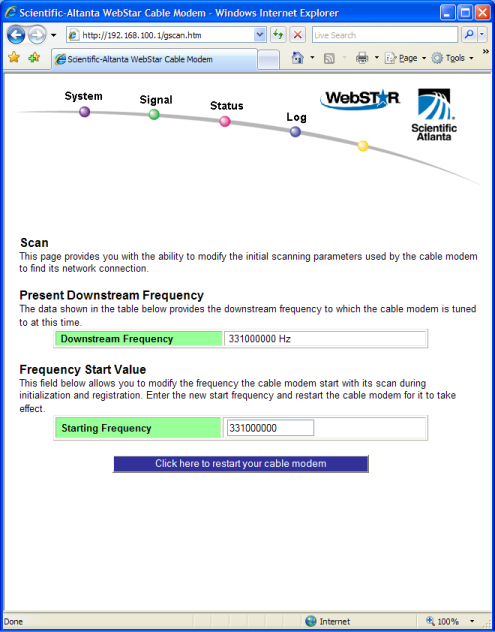 So if your cable modem is having the same problem as this, and the status screen above doesn’t show a ‘correct’ value then this might be the cause of your problems. Double Disclaimer: Don’t blame me if this all goes pear shaped. That seems to happen to some people. I had great fun tracking down this for one of our directors – tried all the usual things, swapped the router out, sacrificed a goat, tried a few different computers, before taking life in hands and calling Virgin. Only took one call, though…. The outstanding problem is that they kept NTHell’s support operation instead of Telewest’s. Thanks for the heads up on this Sam, just a note that if you use a router in your home the 192.168.100.1 address for the router, might not work. Virgin are now changing the modems free of charge. YOU ARE THE BEST….. Thanks!! !